Yay! The weekend has arrived! To kick off the weekend, I'm bringing you three awesome polishes sent to me by the indie brand, Philly Loves Lacquer! Philly Loves Lacquer is a one-woman business venture, owned by a nail polish addict named Esther. All polishes are 3-free and cruelty free nail polish, handmade and hand-blended in the City of Brotherly Love. Because Esther is a big supporter of cruelty-free cosmetics, one dollar of each full size (and $.50 of each mini) bottle of PhLL polish sold will be donated to a local non-profit organization called Forgotten Cats. Forgotten Cats helps to provide homes for adoptable cats and kittens in the PA/NJ/DE areas, as well as finding foster parents for feral cat colonies. Now through 5/18 at 11:59PM EST, Esther is celebrating her birthday with a 27% off all purchases of $15 or more with code HOLYCRAPIM27! Yes, you read that right. Esther is also running a giveaway through the end of the month on Facebook! First up is Mummer's Parade, a magenta jelly base with dark pink diamond, purple and blue hex, orange bar, and fine pink, orange, and purple glitters. The above is with two coats over OPI I Theodora You. Here is two coats of Mummer's Parade over Orly Miss Conduct. The application on this shade was stellar. I didn't have any problem getting the different shapes out, like I've had with other brands. 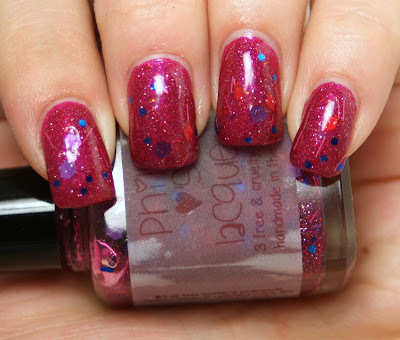 And it REALLY popped well over the pink holo that is Miss Conduct! The next shade is South Street, made of fine turquoise and lavender glitters. Above is one coat over Bootie Babe Nudie Tudie. Here is two coats over Bootie Babe Nudie Tudie. And here is one coat over Dermelect Buzz-worthy. The glitter in this one applied very evenly, which is a major upside. It also dried very quickly and built up nicely, as you can see between the first and second coat over Nudie Tudie. The big surprise for me was how awesome this looked over Buzz-worthy... perfect for summer! Last, but far from lease, is The Devon, a black jelly base with ultrafine lavender glitter, green hex, pink diamonds and squares, blue hex and lavender holo circle glitters. It has some super bright glitters in a dark, vampy base, which is a great combo. I applied two coats of The Devon over Bootie Babe Crack a Toe Uh, a red glitter. I love this blackened blood look. Here is two coats of The Devon over Borghese Stellar Notte. I was hoping that the duochrome nature of Stellar Notte would shine through, but it didn't. Still, the effect of The Devon over black is amazing. The glitter pops SO well! The application of this shade was pretty good. I found that I had a little difficulty getting some of the larger shapes of glitter out, but letting the bottle sit upside down for a minute or two made all the difference. I didn't have a problem after that. Overall, I LOVED these three shades. I think The Devon is my absolute favorite of the trio, but the others were really nice too. I didn't have any gloopiness issues, which is a big upside. 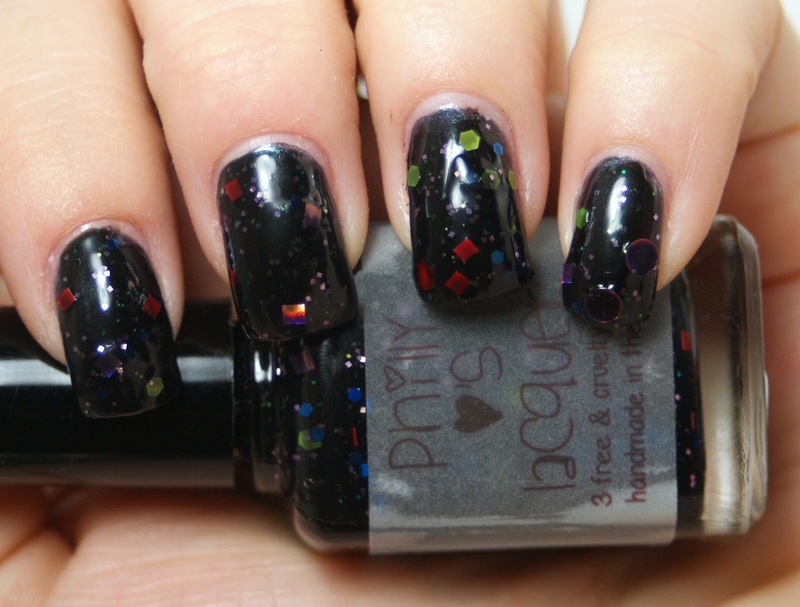 Philly Loves Lacquer is available through Etsy for $10 per 15mL bottle. Remember, Esther is holding a 27% off sale on purchase of $15+ (minimum of 1 full size and a mini to get to that $15 price point)! Be sure to check out the PLL Facebook page, as well! 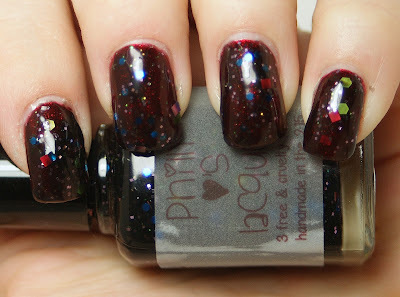 Are you in love with these glitters as I am?